Have you ever heard the saying “less is more”? There are few areas in life where this is more relevant than in your home décor. Our lives can feel cluttered, but that doesn’t mean that your home has to be. One of the best ways to get rid of clutter and keep your home looking simple is by using the Scandi style. Scandi is short for Scandinavian. These countries adopted a design style best described as simple but elegant. Scandi has been popular since the early 1930s but peaked in the mid-1950s. The Scandinavian style embraces natural materials, or at least natural-looking materials, in their interior design. Hardwood floors are the order of the day here. The floors should be raw timber, with some lacquering. Make sure the floor is lacquered and treated or termites will send your floor – and your decorations – to Valhalla. Scandi normally has light-colored wood to reflect light. The Scandinavian countries are dark in the winter for several months, so any light is welcome. Scandi style scoffs at wall-to-wall carpeting. Area rugs for accents are acceptable, however. The rugs should be made of all-natural materials, such as wool or cotton. Keep your rug patterns simple and elegant. Monochrome, muted colors work best. The same goes for pile heights. Lower piles keep the floor looking clean and elegant and are easier to keep clean with a vacuum. For Scandi room layouts, you want clean lines. The legs of furniture should be slanted outward. This makes it more stable so that even in the most boisterous house party the furniture isn’t as likely to tip. For a Scandi bedroom pick a white or light-colored accent piece for the bed. As for the bed frame, it can also be of lighter coloured wood. You can even just ignore the frame completely. Yes, it’s possible to sleep well on a mattress without a frame. Another thing you can try is to have open, communal spaces. The family is everything in Scandinavian cultures. To evoke this sense of family, try replacing individual chairs with a picnic bench set up to promote a sense of togetherness. The lines of the dining bench will tie the room together. This suggestion works best if you have a long room. Pining for the fjords? That’s a good thing when you’re looking for a choice of colors to use in your interior Scandi decor. Muted greens, paled ice blues, ambers, pinks, moss green, and even rust are all integral parts of a contemporary Scandi-inspired home’s colour scheme. Scandinavian people have always looked to nature for colour-coordination cues. Even though someone might say that no colour exists in Scandi style, taking one look at some homes in Denmark or Sweden might give you a very swift rebuttal. Some homes embrace the all-white aesthetic, but not as many as you might think. So why the all-white in the first place? Well, when you’re under the midnight sun, you want as much light as you can. 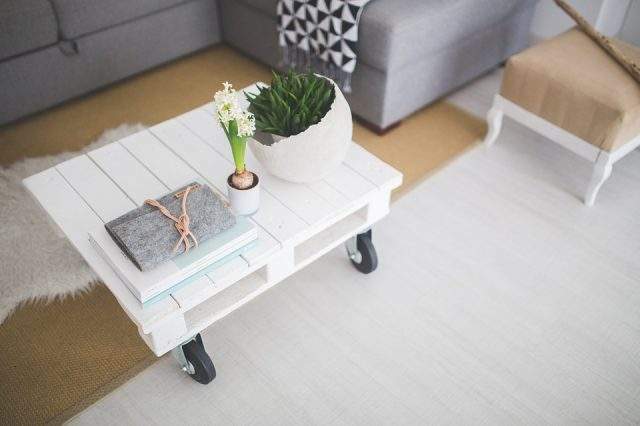 White floors and white furniture are one of the few natural ways to counteract the darkness of nearly six months of winter. Warm colours work well if they’re muted. The warm brown of a leather sofa can bring life to an otherwise dull room. Cool colours have their place, but they work best in the summer. Scandi layouts are simple, yet effective. They focus on clean lines and basic patterns. Furniture is streamlined, with an emphasis on larger pieces. Wide open spaces are a must in a good Scandi-inspired decor. Placing items near the edges and walls of the room gives the illusion of more space. Introduce a touch of greenery into the world. Even in the coldest house, a splash of green from a plant’s leaves can do wonders for the interior’s overall mood. Keep rooms in a Scandi house brightly-lit. Whether you’re talking about natural light or high-powered lamps and light bulbs, Scandi decor works best. Scandi houses rely mostly on natural lighting. Remember: Scandi decor is all about natural simplicity. It should be natural-looking, bright, and simple. Muted colors and designs should feature prominently. Anything that helps to foster a sense of family and community is effective. Mixing elements of one style of decor with another style can create a look all your own, as long as you have a solid base to build upon. Love the Scandinavia look? Make it your own in your home with our range of designer Scandinavian furniture at Brosa.